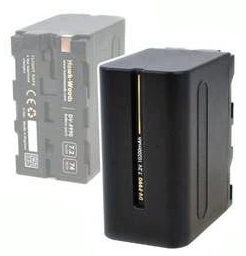 Hawk-Woods will introduce new capacity Sony NPF and BP-U batteries and new ultra-small and lightweight additions to its MDV and BPU battery line at NAB 2019. Hawk-Woods said its MDV and BPU rechargeable battery lines are used to power devices such as cameras, monitors and mixers. To support the growing power needs of camera operators, the company has doubled their range of MDV batteries, and are now offering a new 98-watt hour BP-U battery with dual output. Hawk-Wood’s new MDV range consists of batteries ranging from 18-74 watt hours with different size variations tailored to suit the user’s preference on power versus. weight ratio. The four new additions to the DV range are the: DV-F590 – 25 watt hour (two-cell), DV-F770 – 38 watt hour (four-cell), DV-F790 – 50 watt hour (four-cell) and the DV-F990 - 74 watt hours (six-cell). The largest capacity battery now in the range is the DV-F990 – with 74 watt hours of power and weighing less than 10.5 ounces. Also being introduced is the BP-98UX, a 98-watt hour battery that maintains flight-safe status and comes with two D-TAP outputs. The size is the same as the 75-watt hour version.